Aubrey is from Envy's ENVYHAIR Collection and is a gorgeous short layered style, you can't help but feel so natural in this beautiful head of hair! Smooth or messed up -up to you! ENVYHAIR offers 70% heat friendly synthetic fiber and 30% human hair - looks, feels, moves and styles just like the real thing! Curl it or straighten it - you choose! 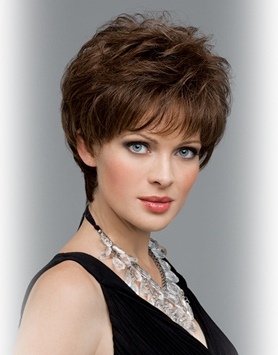 This wig also has a monofilament top and hand-tied sides and back that is designed to appear as your natural scalp and each strand of fiber is hand-tied to simulate natural hair growth. This allows you to part it on the left, right or down the middle - you choose! Bangs: 3.75" Crown: 4" Sides: 3.5" Nape 2"